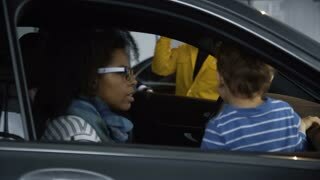 Search Results for "multiethnic couple"
Happy multiethnic couple with son making purchase of car sitting at table with dealer and signing papers. Happy multiethnic couple in pajamas eating fast food. Hungry woman waits the meal, man feeds her a slice of pizza. Beautiful multiethnic couple take the selfie photo on smartphone. Woman hold the smartphone, man kisses her and laughs. Multiethnic couple in pajamas playing the board game. Man and woman laugh. Male throws the dice, moves on the field. Loving multiethnic couple in pajamas dancing on the bed. Man and woman have fun together in the morning. Slow motion. Multiethnic couple lying on bed and using smartphone. Man and woman happy together. Male and female laughing, smiling. Slow motion happy fun multiethnic couple hugging, dancing and jumping over street pedestrian crossing in New York City. Happy young romantic multiethnic couple running along streets of New York City together holding hands and smiling. Happy multiethnic couple in pajamas playing the board game on the floor. Man throws dice and puts the card, woman laugh. Young multiethnic couple lying on bed and use smartphone. Man and woman browse the Internet and talk. View from curtain. Handsome african man throws the dice, laughs and takes the card. Multiethnic couple playing the board game. Multiethnic couple in pajamas sitting on the bed and twist the globe, choose the destination to traveling together. Multiethnic couple lying on bed. 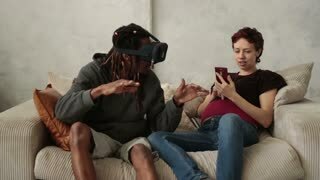 Man and woman laughing, using a smartphone. Male and female spend time together. Slow motion portrait of happy multiethnic couple making heart with their hands, looking at camera and smiling. Romantic relationship, married life and honeymoon concept. Multiethnic couple lying on bed, dancing and listening music. Man and woman in pajamas use smartphone and earphones. Beautiful multiethnic couple in pajamas dancing together and smiling. Man and woman having fun. Slow motion. Happy multiethnic couple in pajamas dancing together. Maw and woman hugs, falls on the bed and kisses. Slow motion. 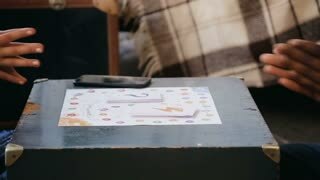 Close-up view of multiethnic couple playing the board game. Man throws the dice, moves on field and takes the card. Multiethnic couple in pajamas having fun together. African man and european woman dancing near the big window, smiling. Multiethnic couple on the bed, fight by pillows, have fun together. Woman in pajamas sitting on the man, kissing him. Multiethnic couple lying on bed, la holding their hands. Male and female look happy. Man and woman enjoy time together. Happy multiethnic couple in pajamas. Woman jumps on man hands, falls on the bed. Male kisses female. Slow motion. Woman throws dice and takes card. Man takes her hand and draws a finger. Multiethnic couple plays the boar game. 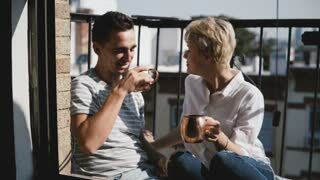 Beautiful young multiethnic couple having coffee at small sunny balcony with bronze metallic mugs, talk and smile. Beautiful multiethnic couple in pajamas on red couch. Woman show something to man, pointing with finger. Slow motion. Loving multiethnic couple lying on the red couch and talking. Man and woman in pajamas hold hands. Slow motion. Happy multiethnic couple looking at globe and picking travel destination. Man and woman in pajamas lying on the bed. 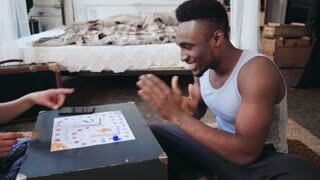 Multiethnic couple in pajamas sitting on the floor and playing the board game. Man and woman laugh and show the monkey. Multiethnic couple on photoshoot. Photographer records video during the man and woman lying on the bed, use smartphone.